Location: Chavkova guest house is located in the centre of Melnik, just 8 km away from the Rozhen monastery. 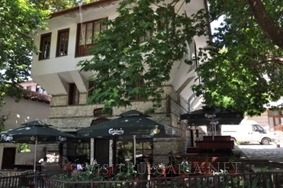 Kordopulovata house wine cellar is just 500 m away. Accommodation: Chavkova guesthouse offers free wireless internet access and TV. Guests of the hotel can enjoy a huge garden. Guests of the hotel can use a free of charge parking lot. All rooms are fully air conditioned and offer individual bathroom. Wine and dine: Guests of the hotel can taste delicious local meals and the famous Melnik wine.